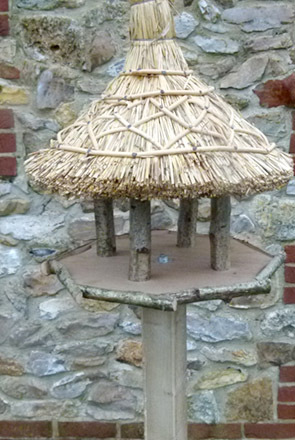 Established in 1985, Richard Butterfield has gained the skills and experience required to craft long lasting thatched bird tables that beautifully complement your property. Combining more than 30 years of experience within the industry with the latest equipment, Richard Butterfield can provide you with high quality, thatched bird tables and bird feeders that are designed around your individual requirements. Prices start from only £180 per bird table or bird feeder. From small bird houses to stand-alone bird tables, you can rest assured that you will be provided a long lasting product that not only provides a resting place for the local wildlife, but also beautifully complements your garden's aesthetics. Not only this, but Richard can also provide you with replacement bird feed or bird table roof. Contact Richard of R.J. Butterfield for more information on the professional thatching services he offers throughout Somerset and the South West area.